Username, Password and Email Fields. In these drop down lists you can choose from the fields added on the grid to determine which field will be called when the action from the button is executed. Generate random password. Enable this option to have DNN Api Endpoint generate a random password. This basically replaces the password fields. The generated password is stored in [RegRandomPass] token so you can use it for example in an email action. Send standard DNN registration email. 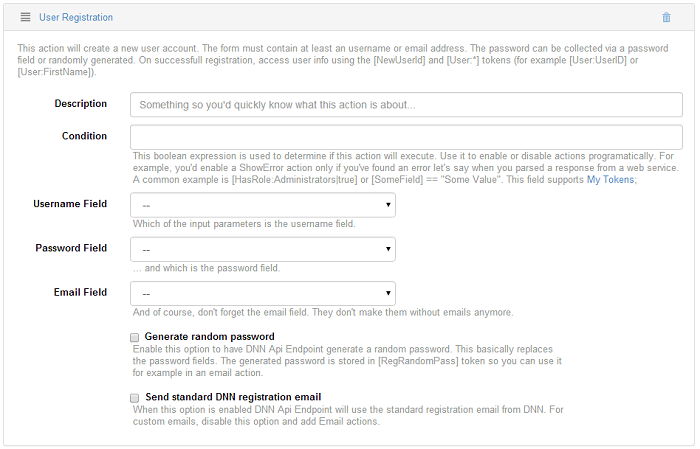 When this option is enabled DNN Api Endpoint will use the standard registration email from DNN. For custom emails, disable this option and add Email actions.